Arriving from Ijmuiden, the Netherlands, at 3:22 a.m. on 1 January 2014, the Panama-registered ship Huang Shan was the first vessel of the year into the Port of Sept-Îles. 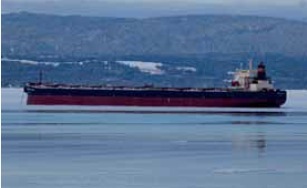 The ship arrived empty and will set sail for Qingdao, China, at the end of January 2014, carrying a cargo of nearly 165,000 tonnes of iron ore from Cliffs Quebec Iron Mining Ltd. The cane award ceremony took place at the traditional Port of Sept-Îles beginning-of-year cocktail reception at the HMCS Jolliet Naval Reserve in the presence of approximately 100 guests. Port of Sept-Îles president and CEO Pierre D. Gagnon awarded the prestigious cane to Captain Fan Kuang-Yun. Several other gifts were presented to the captain in recognition of the achievement by Mayor of Sept- Îles Réjean Porlier and Steeve Charest, general manager of Cliffs Pointe-Noire Division. This tradition, now in its 27th year, marks the arrival of the first ship of the year to anchor in the port. Six vessels were in the running this year, including three destined for Cliffs and three for Rio Tinto IOC.To be eligible, the ship must arrive from a foreign port and be bound for a destination outside the country. Port of Sept-Îles gained a new client,Tata Steel Minerals Canada (TSMC), which shipped 240,276 tonnes of iron ore using the facilities of the mining company Rio Tinto IOC. The year 2013 was marked by intense construction activity on the multi-user dock at Pointe-Noire, requiring an unprecedented investment of nearly $130 million this year. The world-class dock, costing a total of $220 million, is designed to serve new clients from the iron ore industry and will be completed in summer 2014. The port would like to stress the considerable local spinoffs the project is currently generating: 80% to 90 % of the workers come from the region, and services and equipment are provided by local suppliers. The highlight of the year was the arrival of the first Chinamax vessel in the Port of Sept-Îles, which took on 302,264 metric tonnes of iron ore from the Cliffs Natural Resources Lake Bloom mine.“The arrival of the CSB Years is an historic North American milestone and marks the opening of our port to the next generation of giant iron ore vessels,” said Pierre D. Gagnon, president and CEO of the Port of Sept-Îles. Boasting a full range of high-performance facilities, the Port de Sept-Îles is the leading iron ore port in North America, handling more than 27mt a year. Sept-Îles’ port facilities play a vital and strategic role for a number of businesses in the region’s primary sector. The port accounts for an estimated 4,000 direct and indirect jobs, with an annual economic activity of nearly $1 billion.